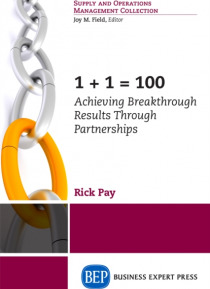 1 + 1 = 100 guides readers through developing, implementing, and maintaining close relationships within their own company (employees, design engineering, product development, sales and marketing, operations, and supply chain) as well out outside (suppliers, customers, and the community). By avoiding overreliance on cost reduction measures and instead developing partnerships, the company, and its p… artners can achieve world-class profitability and cash flow. For more than 30 years, the focus in industry has been to improve productivity and cut costs using approaches like Lean Thinking, World Class Manufacturing, Reengineering, Strategic Supply Chain strategies, and off-shoring. Unlike the techniques that these process improvement methods espouse, partnerships go beyond correcting mistakes or solving problems; they entail looking at the big picture and building on each partner's strengths, making breakthrough results possible for all stakeholders in the relationship. 1 + 1 = 100 speaks directly to operations and supply chain executives in manufacturing and distribution environments, but the concepts are essential for all members of the executive team in any industry that has an operations component and suppliers.